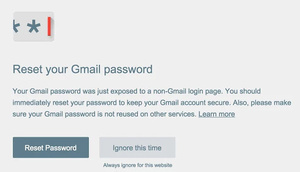 Google has released 'Password Alert' this week, a browser extension for Chrome that will help protect against phishing attacks that are out to get your Google credentials. The new extension is great if you are a user of Google services as it will alert you if you have entered login info to fake Google sign-in pages created to steal your personal info. Google is able to check this by scanning the page against its vast library of sign-in forms to see if it is a legitimate site or not. If you do get duped, the extension will inform you that it is time to change your password and to change the username/password combo on any other site you may have been using it on. If for some reason you need to submit your Google credentials to a legitimate third-party site, you can choose to ignore the extension's warnings. Chrome comes with Safe Browsing phishing protection right out of the box, but Password Alert is great for new phishing sites that may not have been analyzed by Google yet. Read more here via Google.